"Look what I can do with my finger!" Nominees: "Gosford Park" "In The Bedroom" "The Lord of the Ring: Fellowship of the Ring" "Moulin Rouge"
Another long delay between movies. No particular reason, just haven't gotten around to watching this until a few weeks ago and then a delay on writing the review. I think part of it was that we both saw this movie ten years ago and felt like we have seen that done that already kind of feeling. At any rate, on with the review. 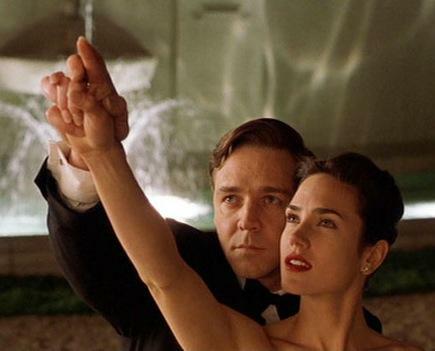 Basically the movie is about a real-life genius mathematician, John Nash, played by Russell Crowe, who has severe mental disease and poor social skills. It follows his life through graduate school at Princeton and on through his life to his eventual Nobel Prize award. Terrific acting all around. Not sure how Russel Crowe didn't win for this, although he erroneously won for Gladiator and Denzel Washington should have won for Hurricane but instead got it for Training Day. So the Academy messed up those two, but they did deserve the awards, just in opposite years, so I guess it doesn't really matter much. As for A Beautiful Mind, really really good acting all around from supporting people like Paul Bettany and Ed Harris, to the stars Crowe and Connelly. Directing was good and I really like how we see things through the mind/eyes of John Nash for most of it, it really puts you in his mind and you feel more connected to him and how he truly believes in what he is seeing. On that note, I saw this movie once already so I knew the story more or less, whereas when I saw it the first time I was really interested in what was going to happen next. This time there was none of that suspense and I didn't relate and empathize with the characters much so it was a bit of a dud this time around. So it is really hard for me to pinpoint the exact problem with the movie. As stated earlier, it has great acting and everything else technically seems good, but it is just missing that certain something. I did notice how old fashioned the visual effects were, albeit this movie is not a high-powered action movie, but it does have some special effects and they just seemed old and simple, which is funny as this movie is only 10 years old. It made me want to watch some 10 year old action movies to see how far visual effects have come. Ultimately it seemed like a fairly poor movie year and I could give this or the first Lord of the Rings movie the best picture, but that is more out of necessity than merit. Gosford Park was certainly not Oscar material, and I never saw the other nominees but none of them seem to stand out in my mind. I am not sure if this is allowed on our review thing, but I call this one a push. And of course this is allowed, this my blog damnit and I can make up the rules as I go along like Richard Branson did in his reality show The Rebel Billionaire: Branson's Quest for the Best where he would change the rules and elimination rules each episode, so odd but kind of cool at the same time. So I say the Academy is somewhat correct on this one. Next up, No Country For Old Men. A movie I absolutely loved when I first saw it, time to see how it holds up to a second viewing. She Said: Stupid Computer Gods. I wrote a fabulous review for this movie. On time even, and before we'd watched the next one. It was charming- funny, thoughtful, and only a little bit rant-y about mental illness and how it's never portrayed very well, and it's all just in your head. In the words of Albus Dumbledore, "Of course it's all in your head Harry, but why should that mean it's not real?" (Sorry, brief digression). And then my computer ate my review. So this is what you get instead. Verdict: The Academy was right. We guess. And I luuuurved Gosford Park. Still, I agree, a fairly weak year for nominees.